I'm a hazard to myself. I'm starting to think that song MIGHT be about me. Why? Well here! Let me show you why! This is what I did this morning. 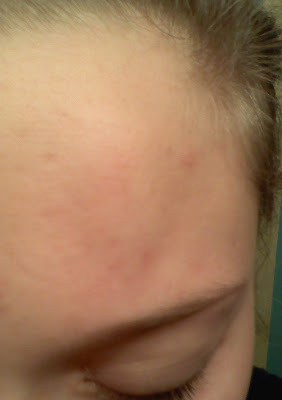 That would a lump...on my forehead...from my own car door. It's so much more impressive in person though...really brings home the idea 'battered woman'...which is totally what we here at Country Mouse Manor are going for. Also, I'm fairly certain my neighbors saw me do it - that's going to really raise their opinion on me isn't it? AND THEN...once I actually got to work, I got to have a face to face chat with one of my supervisors, which never happens. Seriously, I haven't even seen this woman since August, and the one day I talk to her I have a swelling forehead? Are you kidding me? So picture me, standing there pretending nothing is wrong, while this poor woman tries not to stare at the bright red line running from my eyebrow to hairline. I could see her eyes darting up to my injury every few seconds and all I could think was "please don't ask, please don't ask". Now - onto the big question - which would be better in this situation, ice or heat? Ice, right? First aid has never been my thing. Oh my gosh that looks like that HURT! Oh, you poor little thing....I would say ice....hope it does not hurt too much....hope most of the sting is just your ego!! Isn't that the way! Sometimes things happen. Your car door? Your talent to injure yourself amazes me. Which says alot cause I am a MAJOR klutz! Go with ice. Oh ouch sister! Be careful! Ouch! But really, you should have told your boss. And yes - ice and lots of it!